A few weeks back, while my stomach still suffered from the pasty and other Midwestern delights, I went hunting for familiar food. Asian food. Chili and rice, spicy and nice. The stuff that makes my gut feel at home. Then I ordered the pho. “Have you ever eaten this kind of soup before?” the pleasant young waitress asked me. I told her I had many, many times. As with any true bowl of pho, it came with a heaping plate of fresh herbs and lime. I plopped basil and cilantro into the broth, squeezed a bit of lime, added a drizzle of fish sauce and a dollop of chili, and the dish was set. Thus began a conversation with the waitress and a couple of female customers behind me. They are among Milwaukee’s estimated 8,000 to 10,000 Hmong, many of whom fled the Lao government, which continues to persecute the Hmong for their involvement in the Vietnam War (or “the American War,” as it is frequently called in Southeast Asia). Our waitress said she had recollections of the refugee camp in northern Thailand where she lived before moving to the US. But she was too young to remember precisely where the camp was, or the specific events that had led to her being there. She was eager to find a Wisconsinite who knew something about her homeland. We had a good, long discussion of the continuing project Jerry and I have to document the unexploded ordnance (UXO) remaining in Laos since the US bombing campaign in the 1960s and 1970s. Sadly, ironically, many Hmong who sided with the Americans and fought against the Lao government continue to die today as they work in their fields and hit bombs dropped by the US 40 years ago. Read more about the Hmong in America here. Read more about the Hmong in Milwaukee here. Read a story about a Hmong girl living in Vietnam. Cinco de Mayo, Muy Bueno! I urge all to read “Shu’s Story,” about the Hmong girl living in Vietnam. I have read it so often, but it still brings tears. Truly, the most touching story you’ve ever written. My kind of meal! 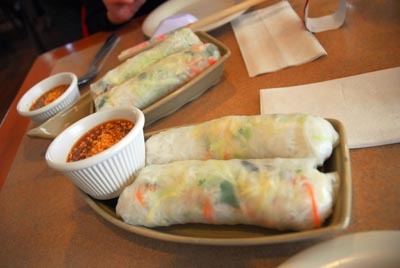 I’m having my Mother’s Day meal tonight–laap and pho. I can’t wait, and this makes me even more excited. Thank you. It is good to know the power of words. And happy Mother’s Day to all moms out there. May you eat well every day. First, the food looks amazing. I have never followed a food blog before (and I don’t follow that many blogs in general), but I will bookmark and return. This is off topic, but I’m on chapter two of “Cambodia Now.” Rarely do I go online to track down an author, but this book is such a gift that I thought I’m mention it directly. Thanks. On his Lightstalkers page, I noticed your husband lists Albuquerque, NM as a “location.” That’s my hometown and we’ll be there in August. Also wondering if you ever pass through. Sorry again for being off topic. Considering the profound subjects you cover in other writings, I’m glad you can enjoy the simple pleasures of a good meal. 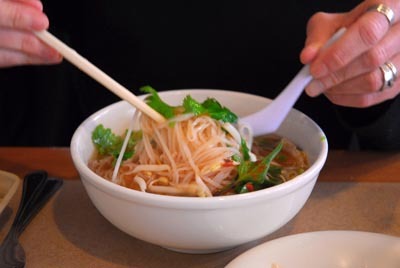 Any recommendations for a memorable bite to eat in Phnom Phen? Many thanks for your comments (and for tracking me down!). I’m grateful to hear the book has been such a help to you. In general I will say this: Cambodian people are among the most open and talkative in the world. Most Cambodians want you to tell their stories. Children, too. As long as they know what you are doing. Many organizations have policies against identifying and photographing people with AIDS (particularly children). But when the people themselves want to be shown and want their stories told, it is a service to them to do so. If you want to chat further on this topic, please email me at karen at ramblingspoon dot com and we’ll take the discussion there. As for New Mexico, we are here right now, buying a house! More on that when the deal goes through…. By August, however, we should be back in Asia. As for memorable bites in Phnom Penh…. so many! The best Khmer food is found at Khmer restaurants run by and for Khmer people (several in Tuol Kok, a couple across the Japanese bridge, and many I’d probably never find again without the help of my good Khmer friends). Whatever you do, eat the fish. And try the major markets, which have food stalls set up inside. Given your interests in Cambodia, you’ll want to try the restaurants run by Friends (Mith Samlanh). Both Friends the Restaurant (tapas) and Romdeng (traditional Khmer food) are staffed by former street kids. Wander the riverfront for an array of options, aimed at foreigners but many are still quite tasty. For Indian, go to Mount Everest. For breakfast, get up early, head to the river and find one of the women with baskets of nom banchok (noodles and curried soup). Then get coffee with sweetened condensed milk at a local shop. If you want fine dining with decent wine, you have many options. Sa offers great rooftop seating with palace views. Thank you. I will send an email. You might want to remove the email address from your comment to avoid getting spam. I’m so sad (really) that we’ll miss you in Albuquerque. I’m not there often myself, but I’d love to show you around. We always find time to eat at The Shed in Santa Fe at least once. I have to eat lots and lots of green chile enchilladas to stock up. Last time we bought several bags of dried green chile (not powder but larger flakes). Supposedly it works very well for making enchillada sauce, but we haven’t tried yet… Gotta remember to do that. I sent an email and another today. I’ll mention it here just in case you aren’t checking that address. I know house hunting must be crazy. Wonderful! I can’t open the link to the story of Shu. Would you mind E-mailing it to me? Thanks for alerting me to the broken link. I’ve fixed it now – please let me know if you still have trouble opening it. Thanks!